Why Is This [BLEEP]er Outranking Me in the Google Maps Results? 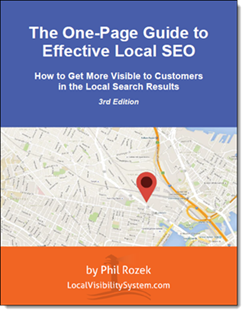 If you’ve made any effort to get your business more visible on Google’s local map, you’ve seen competitors whose visibility there surprises you. Either they’re deadbeats and you have no idea why they rank well, or they’re hardworking and you’re not sure what part of their work has paid off. In either case, you want to know why they’ve put the squeeze on you in the local search results. I don’t know your situation, and probably couldn’t say with 100% certainty what’s going on even if I did know. But I can tell you what I’ve observed over the years. 1. They’ve got better links to their site, or more good links. Not necessarily more than you’ve got, grand total. Quality over quantity. In either case, the best of their links are highly relevant to their industry or local area (or both), or were included in write-ups in the press. How they got those links and how you can get similar (or better) links is a question for another read. For now, I’ll just say that the overall quality of the link profile is in my experience the most common reason one business outranks another and stays ahead long-term. 2. They’re using a landing page URL with a link profile that’s better than yours. Maybe you’re using a subpage or subdomain on your site as your landing page URL for Google My Business (because maybe you’ve got multiple locations). That’s nice as far as the on-page optimization goes, but your location-specific landing page probably doesn’t have as much “link juice” as your homepage has – or as your competitor’s homepage has. 3. They get consistently higher click-through from the search results. For instance, if their name is more relevant or they’ve got more or better Google reviews (or both), more people may click on your competitor than on you. That seems to affect your rankings, if Google observes enough behavior to conclude that searchers clearly prefer one search result over another. 4. Their business name – real or fake – is more relevant. Maybe it shouldn’t be that way. 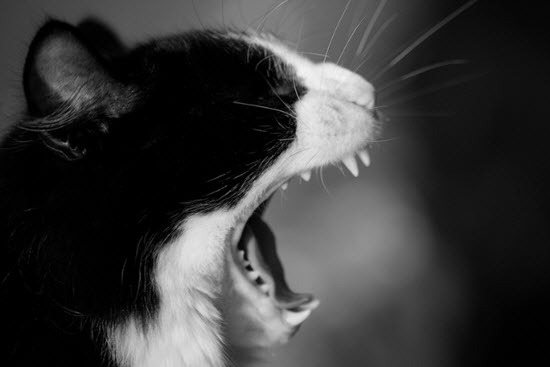 Maybe it’s not really the name of your competitor’s business – and he or she is just spamming. In any case, it’s a factor in your rankings, and it influences click-through (see point #3), which in turn also influences who outranks whom. By the way, if it’s a fake name, do a “suggest an edit” and tell Google what the real name is and where they can see the business’s real name. Recently I’ve had good luck recently in getting those anti-spam edits approved. 5. They’ve got a longer track record of being a relevant search result. That’s often a byproduct of having an older Google My Business page, but not always. 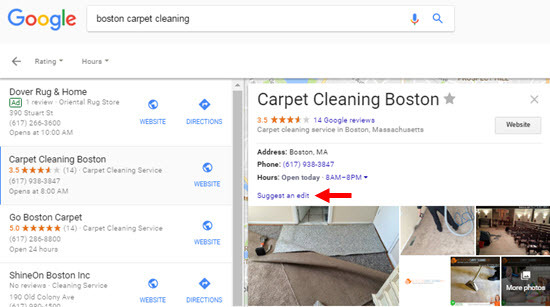 If your competitor has been in business for longer, or has had an online presence for longer, or has more name-recognition, then Google has more data on who clicks, where they’re from, and what they typed in before clicking on your competitor. To Google, your business is a giant bucket of data. Google never empties the bucket, because it cares about what’s in the bucket. 6. They’re being tested. Sometimes Google just flies a business up the flagpole to see who salutes it (see point #3). Google often throws a “new” business into the search results with the businesses that more deserve to be there. If the new kid seems popular with searchers, Google will keep it around unless and until searchers seem to lose interest. 7. Google’s black box. If none of the above is a plausible explanation for why your competitor outranks you for now, then it’s probably for a mish-mash of reasons that only one pocket-protector-toting Google engineer might know. That may sound like a cop-out on my part, and maybe it is, but Google’s local results are mighty deep seas. Which specific search terms does one competitor vs. another outrank you for? How close are you to that business vs. to your business? What did you type in previously? What device did you use? What do your customers see? Exactly what did they type in? Where were they located? How long have the rankings been like that? And so on. Those things are easy. Sure, they usually factor into your rankings, but they won’t separate the sheep from the goats. Any questions or observations? Leave a comment! Phil: That is an excellent review. I think its difficult to fully ascertain these points in an analysis. One that is possibly extremely relevant but very difficult to ascertain is point 3. How do YOU KNOW if the other entity is getting more clicks? Very difficult to tell. Suppose they have a great catchy radio or print media campaign that keeps their name in the public eye all the time. How do I know how often they get clicked on? Over many years, simply through adwords we monitor the volume of name searches of competitors. We do bid directly on their names though we don’t bid aggressively. All we want is some “read” on how strong their name recognition is. Is it better or worse than ours? If its better we try and get our name out more in more ways to have the “best” name recognition. Does that count or matter? I’m not sure though and in what way. 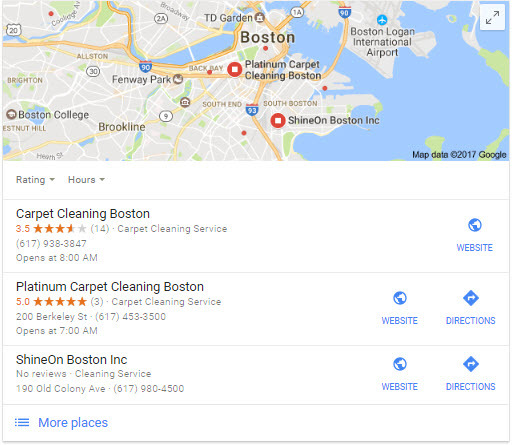 If we are a carpet cleaning service as with one of the examples above…suppose we get more name and direct clicks than a competitor. Does that matter? Suppose the competitor gets more clicks for a discovery phrase such as “family law”. Does that give them the “edge”. I freaking don’t know. Do you have any idea??? (1) I agree it’s difficult (or impossible) to say for sure who has higher click-through and why. (2) I wouldn’t be surprised if Google cares about multiple kinds of click-through – clicks for brand-name vs. discovery searches. (3) Again, some of this is conjecture on my part. Phil, excellent summation on the local phenomenon. My clients are mostly in the medical industry (plastic surgery) and often times we see drastic changes in the local positioning. What sends my clients into a tizzy is when a brand new doctor, perhaps only months out of fellowship, launches a website and spikes to the top. My clients who may have been in practice for 20 years freak out thinking their SEO is awful, etc. I can’t reiterate enough how #6 is a huge factor. As marketers we tell our clients constantly that they should be testing. How can we not expect Google to do the same? A few days go by and results return to normal (or not, which I attribute to CTR) and the client settles back down. Question for you: How do you handle the competition claiming it IS the “unlikely” explanations causing the problem? In my industry my clients are bombarded daily with the idea that “more citations are better” and “Your site isn’t optimized.” I regularly get the, “But Doug, if all of these people are saying it then isn’t it possible that they’re right?” While I know it’s BS and mostly from spammers or shady agencies, it’s hard to combat the constant pings from the [BLEEP]’in competition. Such a good and telling post, Phil. One that deserves to be shared. I will say, I am still struggling with your domain vs. landing page concept. The user experience does seem poor to me. Why? Consider that by shooting the customer from the GMB listing to the homepage, you are expecting them to find that link or blurb you reference, and then click on it. So, we’re two clicks in now – one on the GMB website link and then a second on a homepage/nav link to the landing page (or in the case of a business with dozens or hundreds of location, having to type something into a store locator). I’m not confident that users mightn’t be lost in that process, and you’d have to be able to prove that this two click or click-then-type process isn’t losing enough users to make the poor usability a genuine concern. So, the equation we’d have to weigh would be: if the stronger domain yields a spot one or two places higher in the pack, does the amount of traffic this generates overcome any loss of users who don’t want to have to seek out the store location specific to them? And, ultimately, are conversions being lost because the user isn’t being instantly directed from the listing to a landing page that is geared to their exact needs? I don’t have the hard numbers on this equation, but I’d love to see them. Maybe we’d end up with a compromise. Maybe your homepage strategy would be excellent for a business with 2-3 location with a prominent link to each location in the main menu that the user sees the moment he arrives on the homepage, but maybe this strategy wouldn’t work as well for a business with 600 locations. Maybe expecting the user to click, then notice a store locator function and then enter text into it would be too poor of an experience and would make conversion loss too great of a concern to be ameliorated by ranking in the #2 spot instead of at #3. Ha, long comment – you can see I’ve been thinking about your advice on this. I’d love to see testing and further discussion. 1. Most businesses’ “location” pages are feeble and, usually, not as thought-out as their homepages. 2. 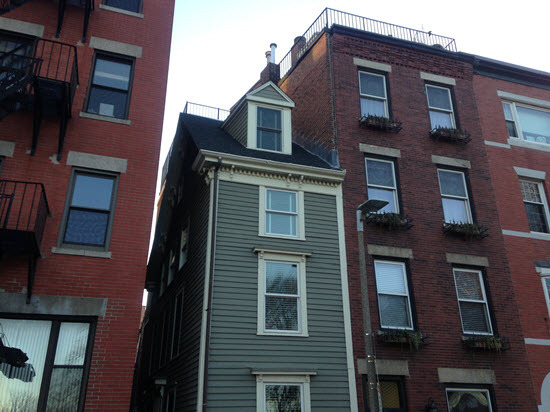 At least in this post, I tried to stick to possible rankings issues. How to use the linkiest page and make it a good UX is easier said than done, for sure. The blurbs-n’-links approach is one way. Not necessarily good for all cases. Prominent links in the main nav – or a big “Find Nearest Location” button – might be a better move in other cases. Yes, totally agree with you about feeble location pages. If that’s the case, and the business refuses to make them awesome, then, sure, link to the homepage. But, if they are your client or mine, we’re going to hammer home the need to make the pages awesome. So, I guess we’re left with ‘it depends’ on this. Clients shouldn’t be allowed to be lazy – haha – and that would solve this problem! Appreciate you chatting with me about this. It’s an interesting point of decision in both the development of the website’s architecture/content AND in the creation of local business listings. Thanks, Phil. I’m struggling with this right now with a prospect, a law firm. What’s crazy is that they rank very well in organic results, sometimes #1, but they are completely missing from the map pack. They don’t have NAP issues, they are very prominent in the community and have been around a long time. They link to their homepage and it doesn’t redirect. They aren’t being outranked by their individual attorneys (none of those are in the map pack either). Their category is correct and they even have a handful of reviews. In fact, the only GMB issue I see is that they don’t have many photos. I guess it’s issue #7! None of those ring true either, but looking back over the possibilities above, I overlooked one. Their name doesn’t include law, attorney, etc. It is Name, Name, Name, P.A. Sure enough, when you search for lawyer, attorney or law firm, business with that in their GMB title seems to dominate. That can likely be changed but something else must be at play for them to be completely missing from a local biz finder with 50-60 results. Hey, but that’s why I love local SEO – there’s always a challenge. Thanks! It’s certainly a factor, but if the client is doing his local SEO well enough to rank in the organic results, but isn’t showing up in the 3-pack, something else is going on. I have a question. If a website invests some money on a Google Adwords Campaign, will Google give your organic ranking a little boost? I mean the company took the time to invest money, and logically that should count for something. I am surprised how much this questions comes up from clients of mine. There is no preference given to Adwords users when it comes to ranking organically in their search engine. There are possible indirect benefits from using Adwords that may influence rankings such as an increase in the time users spend on your site, improved bounce rate and better click-through metrics (assuming you are targeting your ads well) which are metrics Google pays attention. 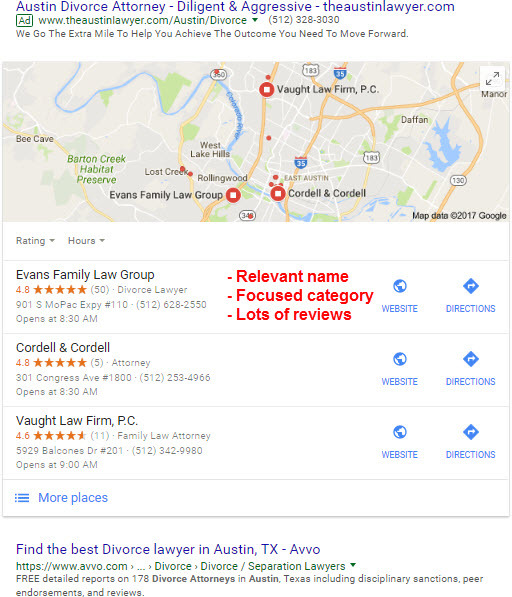 Isn’t a name change bad for local seo ranking? I also thought it was better to have the same name througout to tell the search engines it is the same company. We, in Quebec, have two official languages, so now she may not come up for “boutique erotique”. I would value your opinion on this.